Dynamics of structural transformation of supported heteropoly compound was investigated by IR-spectroscopy, XRD, TPR, and TPO methods. The reaction was investigated in the presence of 15-30% mas. H3PMo12O40- and H3PV2Mo10O40, supported on SiO2 catalysts in process of interaction with O2 (air) in the presence of water vapor, H2, alkane in TPR regime, O2 – in TPO regime (298-1273K), H2O (298, 923K). The rank of reversible structural conversion of supported heteropoly compounds was established under influence of temperature and medium. Keywords: heteropoly acid, carrier, structure, medium, temperature. The combination of acid and red-ox properties which can be changed over a wide range by a variation of the structure and content of heteropoly compounds (HPC) on the carrier, and the nature of carrier is typical for 12 series Mo- and W-HPC with Keggin structure [1-5]. Massive heteropoly compounds of that group - heteropoly acids (HPA) and salts find significant using in catalysis. They are catalysts of the important low-temperature homogeneous, heterogeneous, petrochemical, some commercial processes and also convenient as the model catalytic systems successfully combining both acid and red-ox properties allowing to fix the composition and structure of catalytically active center [4-14]. Compact HPA [9, 15-18] and supported catalysts on the base of 12 series HPC [19-31] were investigated in oxidative conversion of С1-С4 alkanes into oxygen-containing compounds (methanol, formaldehyde), olefins, and hydrogen. It was installed their high activity and stability at Т = 473-1073K and atmospheric pressure in the reaction mixtures containing alkane, oxidizing agent, inert gas and water vapor. The reasons of high activity and heat stability of supported HPA in high-temperature red-ox gas- and vapor-phase processes were not founded till now. At the same time it is known, that compact 12 series Mo HPA have a series of structural transformations on air, argon, water vapor, hydrocarbon +О2 mixture with transferring into oxides of component elements at temperatures (~ 673-873K) [1, 2, 26, 28, 32-38]. It was installed that supporting on carriers (aluminosilicate, SiO2, TiO2 or А12О3) due to formation of finely divided crystallites and structures of HPA-carrier interaction [19-25, 27, 39], using of W-HPA instead of Mo-HPA [1-3, 5, 14, 19, 39], introduction into HPA structure of the proton's substituents (preferable elements of 1 and 2 groups [1,2]), and water vapor into reaction mixture [10, 19-24, 30, 37-39] promote the stabilizing of HPA Keggin structure and increase of destruction temperature. Physical and chemical properties of HPA at low-temperature oxidative catalysis and action of reaction medium are investigated enough [1, 2, 15-18, 25-29, 32-38]. Such investigations are insufficient for high-temperature reactions [19-25, 29-31]. It makes difficult exposure the nature of a stable catalytic action of supported HPC in high-temperature processes including partial oxidative conversion. The experimental data on investigation of thermal stability and dynamics of charging and structural transformations of compact and supported on SiO2 the 12th series Mo heteropoly acids H3PMo12О40•nН2О [РМо12] and H5PMo10V2О40•nH2О [PMo10V2] in conditions of consecutive influence of components: О2 of air at the presence water vapor, Н2, О2, and Н2О at the temperatures of real oxidative processes (473-1273K) are demonstrated in paper. Fig. 1. TPR spectra of H3PMo12О40 heated on air at the presence of water vapor (1:0,21 mol.) at different temperatures, К: 1 – initial sample, 2-473, 3-573, 4-673, 5-773, 6-873, 7-973, 8-1073. Industrial H3PMo12O40•nH2O was used for experiment after recrystallization from ether solution and Н5РМо10V2О40•nH2O, synthesized by a technique . The catalysts (15-30% HPA) supported on SiO2 have been prepared by impregnation of the carrier by water solutions of HPA on a moisture capacity with the subsequent drying on air at 383K within 5 h.
Physical and chemical properties of catalysts were investigated by complex of methods: XRD on DRON-407 device with the cobalt anode, and IR-spectroscopy - on SPECORD-75 spectrometer in tablets from KBr. Spectra of thermal programmed reduction by hydrogen (ТPR) and thermal programmed oxidation by oxygen (ТPО) were detected by registration of absorbed Н2 or О2 at 293-1273K by chromatographic method with thermal conductivity detector at passing of Аг-5%Н2 (vol.) or Не-5%О2 (vol.) mixtures (40sm3/min) and speed of the programmed rise of temperature - 8 degrees/min. For 15-30% Н3РМo12О40 and H5PMo10V2О40 supported on SiO2, used in reactions of partial oxidation of СН4, С2Н6, and С3Н8-С4Н10 [19-24, 30, 39], the character of structural transformations at influence on the initial sample of an oxidizer (air at the presence of water vapor, 1:0,21, mol. ), a reducer (Н2) and an oxidizer (О2) in ТPR, then ТPO regimes at heating (298-1273K) with the subsequent processing by water (or superheated steam) (Т = 298K, ? 923K) was investigated. Supported HPA are characterized by several peaks of TPR by hydrogen of structural oxygen: Тmax = 673-693, 833-863, 1113-1133, 1273-1293K - [PMo12], and 723-743, 883-913, 1173-1183, 1273-1323K - [PMo10V2], presence in IR spectra of absorption bands (a.b.) from valence and deformation fluctuations of metal-oxygen bonds in functional groups: Mo/O\Mo - 780-785 (bridge angular), Мо-О-Мо - 860-870 (bridge linear), Мо=О - 960 (terminal), Р-О-Мо - 1060 sm-1 for [PMo12] and in [PMo10V2] - a.b. 505, 590 (V-O-Mo), 1050 sm-1 (P-O-Mo); occurrence on roentgenograms of some diffraction maximums (d.m.) in the field of 2? = 8-12о (12,20; 11,04; 9,93; 9,48; 8,10) and 2? = 32-33о (2,87; 3,09; 3,30) due to formation on the carrier the crystallites of the Keggin type HPA (Fig. 1-3). In case of [PMoV2] - containing samples occurrence of d.m. 2? = 25-26о (dn=4.0-4.08 ?) is observed. They are concerned to signals from V-containing fragments of V-O-MoOx type [25-29, 33-38]. Probably, these d.m. belong to V-O-Mo functional groups of HPA. Change of HPA content on SiO2 from 50 up to 15 % mas. in comparison with compact HPA does not influence on position of a.b. and d.m. in the specified spectra. Data set of IR spectroscopy, XRD, and ТPR methods testifies about formation of the 12th series Keggin type HPA crystallites in 15-30 % catalysts from [PMo12] and [PMo10V2]. It is correlated with data of classical researches of HPA structure . Heating of HPA-containing catalysts on air at the presence water vapor (1:0,21) at 473-673K does not lead to essential changes of IR and XRD spectra. It indicates on stability of their structures in the specified temperature interval. However the heating on air at Т ? 773K leads to destruction of supported HPA and formation of МоО3. Disappearance from XRD spectra of d.m. 2? = 8-12о and occurrence of the new diffraction maximums from МоО3 phase (6,93; 3,81; 3,46; 3,26; 2,70; 2,66; 2,31) with a rhombic lattice (ASTM-5-0508) (Fig. 3) indicates on that fact. Similarly essential changes were found in IR spectra after heating on air at Т ? 773K. There are new absorption bands 480, 620, 1000 (intensive) and 870 from МоО3 phase. A.b. from HPA: 780-790 sm-1 (Мо/О\Мо) and 1060 sm-1 (Р-О-Мо wide) for [PMo12 HPA] are kept too. Widening and increase in intensity of a.b. in the field of 850-870 sм-1, probably, due to overlapping in this peak of two adsorption bands - 860 from HPA (Мо-О-Мо) and 870 - from one of the bands formed on the basis of Мо6+ ion (РМо12 HPA) of МоО3 phases were observed also. Disappearance of a.b. 950 sm-1 from terminal groups of HPA (Мо=О) is observed (Fig.2). Fig. 2. 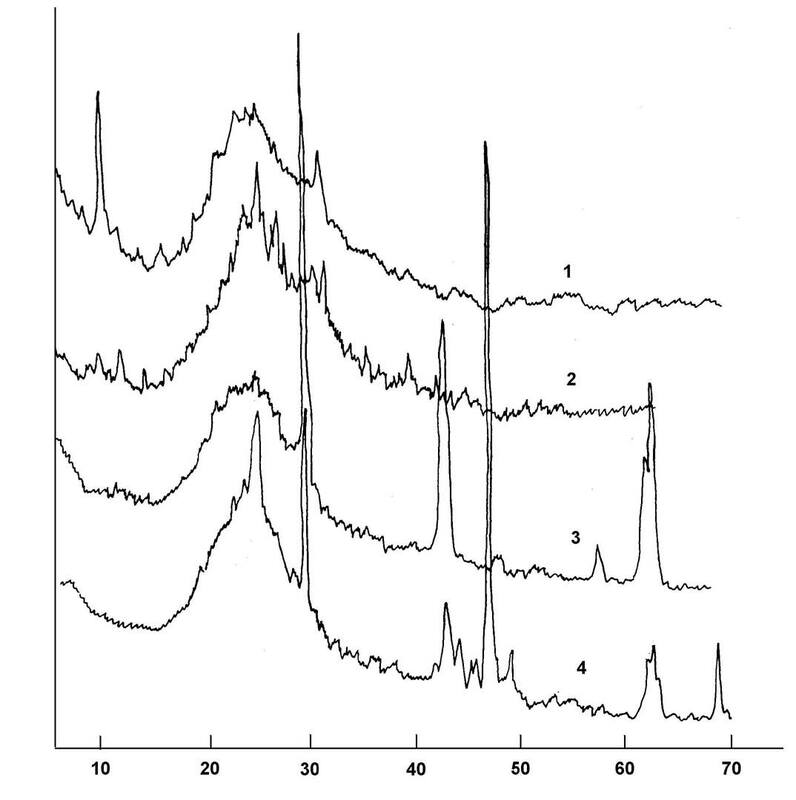 IR spectra of 30%Н3РМо12О40/SiO2 heated on air at the presence of water vapor (1:0,21, mol) at different temperatures, К: 1 – initial sample, 2 - 473, 3 - 573, 4 - 673, 5 - 773, 6 - 873, 7 - 973, 8 -1073. Heating on air at the presence of water vapor at more high temperatures (973-1073K) changes a.b. position a little from the kept fragments of HPA, combined HPA+МоО3 (860-870 sm-1), and МоО3. However the intensity of the a.b. of Р-О-Мо considerably decreases and its shift from 1060 to 1150 sm-1 due to formation of molybdophosphates is observed. At increase of the temperature of steam-air processing of catalyst up to 1073K, according to micro diffraction of electrons, apart from hydroxylated molybdenum oxide (d ? : 4,26; 4,07; 3,43; 2,88; 2,63; 2,39; 2,21; 1,94) appear d.m. from Р2О5 with interplane distances d ? = 4,26; 4,07; 3,43; 2,88; 2,62; 2,39; 2,21 which coincide with data of ICPDS 23-1302 catalogue (it was found on an example of compact HPA). Fig. 3. 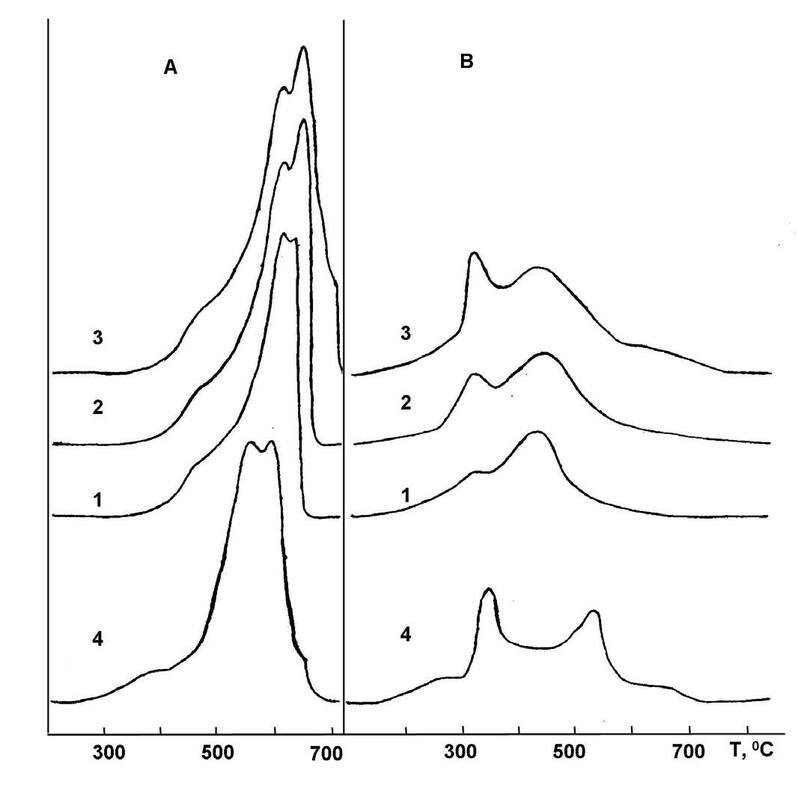 XRD spectra of 30%Н3РМо12О40/SiO2 heated on air at the presence of water vapor (1:0,21, mol) at different temperatures, K: 1 – initial sample, 2 - 473, 3 - 573, 4 - 673, 5 - 773, 6 - 873, 7 - 973, 8 – 1073. In case of supported [PMo10V2] catalyst after the beginning of destruction at heating on air + Н2О (Т ? 773K) appear the new wide a.b. at 460, 550, 840, 990 sm-1 which can be superpositions of a.b. from V2O5 (460, 580, 810, 1000 sm-1), МоО3 (590, 860, 990 sm-1) or mixed V-О-Мо oxides [33, 36-41]. The received results allow to assume, that the beginning of structural destruction of crystalline [PMo12] begins from ? 773K (disappears characteristic a.b. 950 sm-1 from Мо=О), МоО3 phase is formed. Thus up to 1073K are kept a.b. in the field of 1060-1150 sm-1 from Р-О-Мо (molybdophosphates). However the subsequent processing of the sample by superheated steam at 923K leads to renewal of the all of a.b. in the IR-spectrum, which characteristic for Keggin type HPA with high intensity (780,860,940,1060 sm-1) (Fig. 4). Fig. 4. IR spectra of 30% Н3РМо12О40/SiO2 (1) and heated on air at the presence of water vapor at 1073K (2) and after regeneration (923K, water vapor) (3). On the basis of the above-stated results it is possible to assume, that introduction in a reaction mixture of water vapor promotes «regeneration» of the Keggin structure of [PMo12] from a mixture of remained fragments after calcination (Мо-О-Мо, Мо/О\Мо - bridge, molybdophosphates) as due to reoxidation, and introductions of Н2О molecules into Keggin skeleton with formation of fluidized structures . The role of water as oxidizer in the processes of partial oxidation, oxidative dehydrogenation of methane was established by a combination of isotope and kinetic methods in works [22, 24, 39]. The occurrence in IR spectrum of the a.b. 800, 870 (traces), 960 and 1060-1120 sm-1 is characteristic for catalysts from [PMo12] HPA on the carrier after processing on air at the presence of Н2О. All bands are displaced in the region of higher frequencies in comparison with similar bands for compact HPA (Fig. 1, 5). Heating of the sample in a steam-air mixture at 473-673K does not change position of the above-stated bands. Comparison of spectra for compact and supported HPA shown that supporting raises thermal stability of the structural fragments of Мо/О\Мо, Р-О-Мо from 673-773K (HPA) up to 1073K (HPA-carrier) – that is on 300-400 degrees. Thus, the received results specify that supporting on the carrier raises thermal stability, and processing of HPA samples after thermal destruction by superheated water vapor leads to regeneration of primary Keggin type structure at partial preservation of fragments (Мо-О-Мо, Р-О-Мо) and formation of МоО3 phase. Only weak preservation of a.b. from МоО3 after high-temperature processing by water vapor, presumably, can specify also an opportunity of the some evaporation of МоО3 in steam-air medium . However, the results of emission analysis of the studied HPA and corresponding supported catalysts after steam-air processing at 673-923K specify on preservation of V:Mo=2:10 and P:Mo=1:12 ratios in samples. Thus, research of thermal stability of the [PMo12] and [PMo10V2] HPA in a steam-air mixture by IR-spectroscopy has shown, that it is steady at temperatures ?673K. The beginning of HPA destruction on oxide components (МоО3, V2О5, P2O5) is possible at the temperatures ? 773K together with intermediate oxide-like formations (Р-О-Мо, V-O-Mo), and at 1023K - with formation of МоО3 phase, molybdophosphaters with preservation of low-intensive HPA a.b. The subsequent processing of samples in water (superheated steam) after steam-air processing at 923, 1023K leads to strongly pronounced «regeneration» of the Keggin structure of HPA (a.b. 780, 860, 960, 1050 sm-1) at preservation of low-intensive a.b. from МоО3 (580, 870,980 sm-1) (Fig. 4). Further the results of investigation the interaction of structural oxygen of catalysts with hydrogen (TPR method) on an example of compact (and supported) HPA are shown. Fig. 5. IR spectra of 15%Н3РМо12О40/SiO2 heated on air at the presence of water vapor at different temperatures, К: 1 – initial sample, 2 - 473, 3 - 573, 4 - 673, 5 - 773, 6 - 873, 7 - 973, 8 – 1073. Removing of a part of oxygen from supported H3PMo12О40 (preliminary, air : water vapor=1:0,2) by interaction with hydrogen in TPR regime up to ~773K (Fig. 1) of insignificant part of structural oxygen of HPA (the first low-temperature peak of the absorption of Н2 (573-773K) leads to disappearance in IR-spectra of a.b. 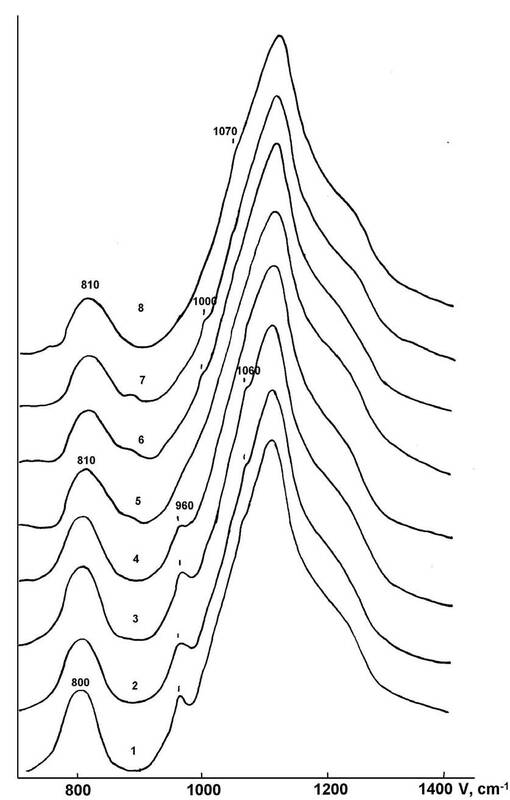 780, 870, 960 and 1050 sm-1, describing the presence of Keggin structure and occurrence of a.b. from МоО3, and on roentgenograms - disappearance of d.m. 2? = 8-12о from HPA and occurrence wide weak d.m. from МоО2,76 (ао=21,615, во=19,632, со=3,9515?, ICPDS 13-345) and diffraction maximums from МоО3 with orthorhombic lattice (ао=3,962, во=13,858, со=3,697?, ICPDS 5-058). These data indicate on beginning of the destruction of H3PMO12O40 crystal structure (I region of TPR) and formation of heteropoly anion-like structural groups of МоО2,76-МоО3 type on the basis of Mo6+ components. Parallel formation of Мо5+ ions together with Мо6+ ions in conditions of steam-air thermal treatment of [РМо12] HPA was shown us by EPR method on occurrence of two signals. They differ in temperatures of occurrence and values of g-factors of Мо5+ I (g? = 1,89, g? = 1,95, Tmax=773K), Мо5+ II (g? = 1,91, g? = 1,95, Tmax ? 873K). Data allow to assume, that formation of МоО3 phase on the basis of heteropoly anion occurs through formation of Мо5+ (I) and Мо5+ (II) ions, possibly, in structure of intermediate structures O = Мо6+-О-Мо5+ = O, O = Мо5+ Мо5+ = O, that earlier was established and discussed in [1, 2]. These data specify on destruction of HPA structure and formation of MoO3 phase on the basis of Мо6+ ions of heteropoly anions. Fig. 6. XRD spectra of 15% Н3РМо12О40/SiO2 catalyst after steam-air processing (1:0,2, mol., 373K) (1) and after reduction by hydrogen (H2 + Ar) at TPR regime heating up to 673K (2), 973K (3), 1273K (4). At increase of interaction temperature of supported HPA with hydrogen in TPR regime up to 973K when leaves about 1/3 of all structural oxygen, it is observed reduction of the arisen MoO3 on the basis of HPA with formation of МоО2 (d = 3,42; 2.43; 1,71, JCPDS 32-671) according to XRD data. Then МоО2 reduced up to metallic molybdenum - Моo (d=2.23; 1.57; 1,29 ?, JCPDS 4-0809) with preservation of small impurity of МоО2 at interaction with hydrogen in TPR regime (1173-1273K) (Fig. 3, 6). 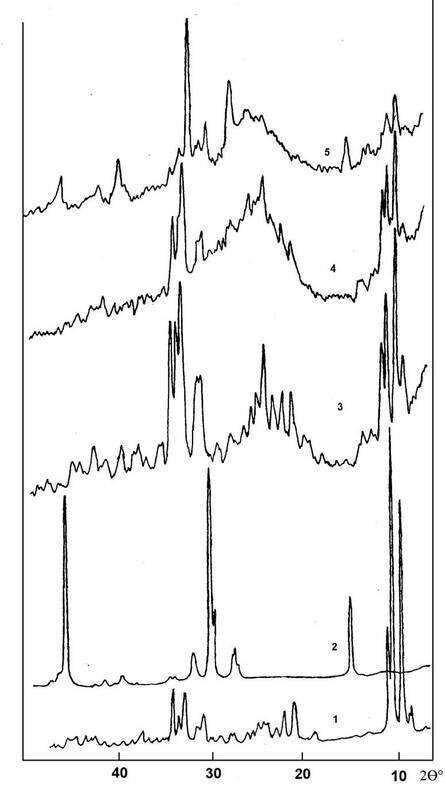 Thus, these stages of reduction of the H3PMo12О40/SiО2 are reflected in occurrence in TPR spectra the peaks of hydrogen absorption at 573-773K (reduction and decomposition of HPA), 773-1023K (reduction of МоО3 into МоО2), 1023-1273K (reduction of МоО2 into Мо°). Fig. 8. TPR spectra (a) of 30% H5PMо10V2O40 (1, 3) and Н3РМо12О40/SiO2 (2, 4) catalysts heated up to 843K (1), 933K (2, 4) and 983K (3) with subsequent cooling up to 298K. Than TPO of catalysts (b) were carried out at 298-1073K. Reoxidation process by oxygen of 30%Н3РМо12О40 and 30%H5PMo10V2О40/SiO2 catalysts in TPO regime after their preliminary reduction by hydrogen (ТPR) to formation of Моo proceeds in the field of temperatures 473-1023K with appearance of three absorption peaks of О2:Тмax - 593-603, 683-703 and 743-763K for [PMo10V2]/SiO2 catalyst and Тmax - 623-643, 703-723 and 803-823K for [PMo12]/SiO2 catalyst (Fig. 7). It is visible, that reoxidation is the process on 100-200K more low-temperature, than reduction process of supported catalytic systems - namely Mo 12th series of HPA. From comparison of data on Тred and Тox of molybdenum in H5PMo10V2O40/SiO2 and H3PMo12О40/SiO2 systems follows, that introduction of vanadium into H3PMo12O40 structure leads to increase of interaction temperature with hydrogen of structural oxygen and temperature of formation of molybdenum oxides and Мо°, but reduces reoxidation temperature of the reduced forms of molybdenum in comparison with H3PMo12О40/SiO2 ~ on 30-50K. Partial replacement of molybdenum on vanadium in [PMo12] heteropoly anion reduces reduction speed (raises Тred) of acid-formation cation Мо6+ ? Моo, but increases reoxidation speed (reduces Тox) of Мо°, formed on the basis of HPC, into Мо4+ and further Мо6+ oxides. Thus, reversible transition of Мо6+ (МоО3) ? Мо° is observed in catalysts from 12th series HPA on the carrier under influence of oxidation-reduction components (О2, Н2) at the temperature interval 773-1273K. It predetermines an opportunity of carrying out of the reaction of partial oxidation of С1-С4 alkanes on the oxidation-reduction mechanism. The spectra of thermal programmed oxidation of [PV2Mo10]/SiO2 and [PMo12]/SiO2, preliminary reduced in Н2 (ТPR) up to 843, 933, 983, 1273K (Fig. 6, 8) with formation of МоО3, МоО2 and Мо° (XRD) phases were fixed for deepening of concept about the oxygen participating in reoxidation of reduced molybdenum forms from heteropoly compounds. 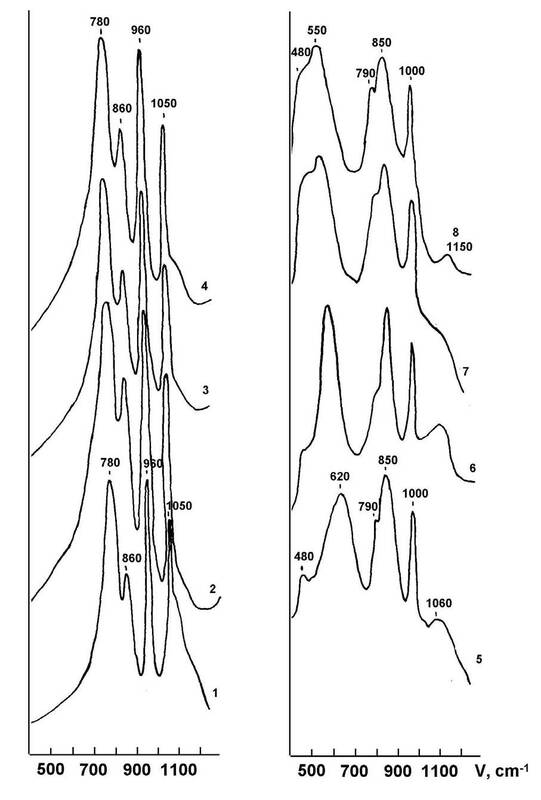 Reoxidation of deeply reduced sample of [PV2Mо10] (up to Мо° ~ 1273K) is accompanied by occurrence of 3 peaks of the absorption of oxygen (603, 703 and 763K) in thermal programmed regime. Reoxidation of reduced up to 983K catalyst (up to МоО2 - XRD) is accompanied by occurrence of two peaks of absorption of the oxygen (Тmax - 603 and 733K) in thermal programmed regime, and reoxidation of reduced up to 843K catalyst (МоО3+МоО2 phases) leads to sharp reduction of absorption peak of О2 I (603K), but to preservation of intensity of absorption peak of О2 II (733K). Thus, if the process of HPA reduction proceeds through a stage of partial reduction up to МоО3, then - МоО3 up to МоО2 and further МоО2 up to Мо°, the process of reoxidation even МоО2 into МоОз is accompanied by occurrence of 2 peaks of oxygen absorption. Reoxidation process is more difficulty in case of Мо°. Here there is a new more high-temperature area together with peaks, characteristic for oxidation of МоО2 phase into МоО3. Stage-by-stage oxidation in TPO regime of strongly reduced catalysts has not allowed to find occurrence of new МоОх phases by XRD method due to them X-ray amorphism. Thus there was only gradual reduction of reflexes from Мо° on diffractogramm. Only after heating in TPO regime up to 1073K there were reflexes from МоО3 and disappeared one from Мо°, appeared d.m. 2? = 8-13° from Keggin structure of HPA and d.m. in the field of d = 4,00-4,07? - presumably structural groups V-O-Mo from HPA. Results can indicate on thin distribution of a mixture of oxide components on the carrier formed on the basis of 12th series HPA. It creates preconditions for appearance of strong interaction effect in system “HPA, oxides – carrier” with formation together with the maximum (phase) oxide МоО3 also HPA of Keggin structure due to interaction of MoO3+V2O5 and SiO2 at a reoxidation stage. Behavior of V and Р has not been determined in these experimental conditions. Interaction under influence of environment and temperature with formation of 12th series HPA earlier observed in case of MoO3/SiO2 catalysts in disperse systems, and formation of 6th series Мо HPA - in MoO3/A12O3 catalysts [25, 27, 29]. Fig. 9. 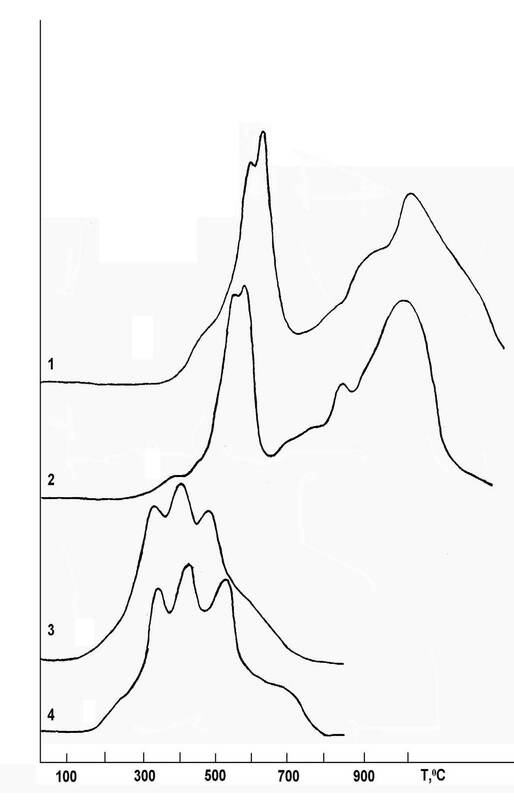 IR-spectra of 30%H5PMо10V2O40 /SiO2: 1- initial sample processed by air-steam mixture (1:0,21 mol., 373K); 2 – the first sample after TPR up to 923K, TPO up to 873K, Н2О- 298K, 923K), IR spectra of condensate; 3 – the first sample after TPR up to 1273K, TPO up to 1123K, Н2О- 298K, 923K), IR spectra of condensate. It was studied influence of the processing of catalysts after ТPR and ТPO by water at 298K on structure of supported active phase for revealing of opportunities for repeated formation of heteropoly compounds on the carrier (SiO2) after high-temperature stages of reduction and oxidation, leading to destruction of HPA on oxide components (mixture of Р-О-Мо, Р-О-V, V-О-Мо with preservation of the micro formations of HPA). Investigation of the influence of water is connected with known data about an active role of water in formation Keggin's skeleton of HPA, stabilization of their acid and oxidation-reduction properties [1-4, 24, 30, 32, 36]. It was established by us, that the keeping of 30%H3PMo12О40/SiO2 catalyst in water preliminary treated by TPR with hydrogen up to 923K (there are МоО3, МоО2 phases) and ТPO up to 873K, or ТPR with hydrogen up to 1273K (Мо°) and ТPO up to 1123K, leads to reduction the structure of heteropoly compound on a surface of the carrier. Renewal the d.m. in the field of 2? 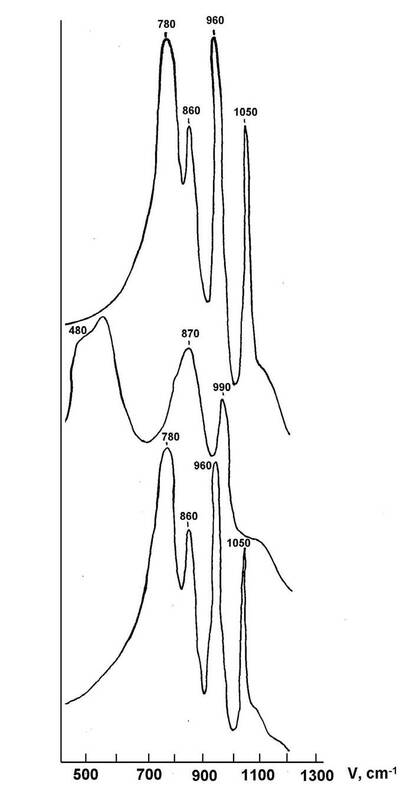 = 8-13° in XRD spectra and the absorption bands belonging to functional groups of HPA at partial preservation of МоО3 phase in IR spectra indicate on that fact (Fig. 9, 10). Fig. 10. XRD spectra of compact H5PMо10V2O40 (1), after oxidation in О2 at 1023K (2) and processed by water (2) at 298K, condensate (3); XRD spectra of 30% H5PMо10V2O40/SiO2 catalyst (4), after TPR up to 923K, TPO up to 873K, and processed by water at 298K, condensate (5). It was found similar properties in case of compact H3PMo12О40?Н2О HPA at a stage of high-temperature oxidation on air at the presence of water vapor at 1073K. Disappearance of d.m. 2? = 8-13o from XRD spectra, and a.b. belonging to functional groups of HPA in IR spectra indicate on that fact. HPA phase together with preservation of some part of МоО3 phase are formed again after keeping in water (superheated steam), because characteristic d.m. and a.b. from HPA are regenerated in XRD and IR spectra (Fig. 4). Thus, in researches of structural changes of HPA in 30%H5PV2Mo10О40/SiO2 and 30%Н3РМо12О40/SiO2 by TPR TPO, IR, and XRD methods at stages of their step reduction, the subsequent oxidation at 773-1273K and processing by water (298K, superheated steam) we observe reversible cycle of structural and phase transformations of HPA under influence of environment and temperature. Reversible cycle of the charging conditions of molybdenum in MoO3/SiO2 catalyst under influence of oxidation-reduction components of environment and water at heating was found earlier by EPR method . Data obtained by us specify on lability of HPA/SiO2 system in oxidation-reduction conditions and influence of water at the temperatures close to temperatures of the reactions of partial oxidation and oxidative dehydrogenation of alkanes and easy regeneration of active structure of heteropoly compound from finely divided mixture of oxides under influence of О2 and Н2О. It explains stability of the 12th series Mo heteropoly compounds, supported on Si-containing carrier at high temperatures (873-1073K) in partial oxidative conversion of alkanes at the temperatures providing reversible destruction of HPA on oxides, dispersion the last under influence of О2 and formation of HPA under influence of water vapor and temperature at some preservation of HPA elements (МоО3, for example) in samples in the form of oxides. The shown opportunity of Keggin structure regeneration from fragments of thermal destruction of Mo HPA by introduction of water or superheated steam in reaction mixture (О2, alkane, Н2) was patented by us as one of the ways of «regeneration» of the stability and activity of supported catalysts at long using at high-temperature processes of partial oxidation of methane to formaldehyde and ethylene (? 923K) . For Н3PW12O40-, H4SiW12O40/AlSi catalysts the long stability of catalytic actions at high-temperature processes of oxidative conversion of methane and ethane to ethylene (973-1073K) in case of introduction into reaction mixture of superheated steam (hydrocarbon : Н2О = 1: 0,2?2,5) was recorded too. The effect is connected with stabilization of HPA structure that is confirmed by complex researches by TPR, IR and XRD methods . 1. Misono M., Catal.Rev.-Sci. Eng . 29 (1987) 269. 2. Misono M., 10 Int.Congr. Catal. Budapest (1993) 69. 3. Misono M., Mizuno N., Katamura K. et al, Bull. Chem. Soc. Japan. 55 (1982) 400. 4. Misono M., Catalysis Today. 100 (2005) 95. 5. Kozhevnikov I.V., Uspekhi khimii. 56 (1987) 1417. 6. Dieu Ai C., Reich P. et al., Z. Anorg. Allg. Chem. 526 (1985) 86. 7. Izumi Y., Ogawa M., Urabe K., Appl.Catal. A 132 (1995) 127. 8. Mamoru A., J.Catal. 71 (1981) 88. 9. Udalova O.V., Shashkin D.P., Shibanova M.D., Кrylov O.V., Каtaliz v khim. i neftekhim. promysh. 6 (2007) 3. 10. Jashikata I., Shokubai. Catalysts and Catalysis. 39 (1997) 2. 11. Chernyshkova F.A., Neftekhimija. 31 (1991) 579. 12. Mitsutani A., Catalysis Surveys from Japan. 1 (1997) 121. 13. Оdjakov V.F., Matveev K.I., Litvinenko N.I.. Mater. Vsesojuznogo Sovesh. Novosibirsk. Inst. Kataliza SO AN SSSR. (1978) 233. 14. Kozhevnikov I.V., Uspekhi khimii. 62 (1993) 510. 15. Cavani F., Comuzzi C., Dolgetti G., Trifiro F., J.Catal. 160 (1996) 317. 16. Nowinska K., Sopa M., Szuba D., Napruszewska M., Barez M., Dudko D., EUROPACAT-IV, Rimini, Italy (1999) 850. 17. Mizuno M., Shokubai. Catalysts and Catalysis. 39 (1997) 468. 18. Kasztelan S., Moffat J.B., J.Catal. 116 (1989) 82. 19. Savelieva G.A., Tungatarova S.A., Shingisbaev B.M., Sass A.S. et al, 7th Int. Symp. Heter. Catal., Bourgas, Bulgaria (1991) 715. 20. Tungatarova S.A., Savelieva G.A., Dossumov K.. TOCAT 4, Tokyo (2002) 243. 21. Тungatarova S.A., Savelieva G.A., Аntonova N.A., Izv. NAN RK, Ser. khim. 4(2000) 26. 22. Tungatarova S.A., Savelieva G.A., Dossumov K., Proc. NATO Advan. Study Inst. Vilamoura, Algarve. (2003) 345. 23. Dossumov K., Savelieva G.A., Bekbatyrova G.M., Abdukhalykov D.B., TOCAT 5, Tokyo (2006) 168. 24. Тungatarova S.A., Аvtoref. dis. kand. Аlmaty, Каzakhstan. (2002) 31. 25. Davydov A.A., Goncharova O.I., Uspekhi khimii. 62 (1993) 119. 26. Andrushkevich T.V., Plyasova L.M. et al, React. Kinet. and Catal. Lett. 12 (1979) 463. 27. Davydov A.A., Kuznetsova T.Y., Andrushkevich T.V., React. Kinet. and Catal.Lett. 30 (1981) 173. 28. Maksimovskaja R.I., Bondareva V.M., Litvak G.S., Kinetika i kataliz. 41 (1996) 1173. 29. Jurieva T.M., Shokhireva T.Kh., Goncharova O.I., Boreskov G.K., Kinetika i Kataliz. 26 (1985) 1439. 30. Pre-pat. RK № 5748. Savelieva G.A., Tungatarova S.A., Popova N.M.. 15.01.1998. 31. Cavani F., Koutyrev J.B., Trifiro F., Catal.Today. 28 (1996) 319. 32. Мaksimov G.M., Uspekhi khimii. 64 (1995) 480. 33. Chumachenko N.N., Maksimovskaja R.I., Tarasova D.V. et al., Kinetika i kataliz. 25 (1984) 653, 659. 34. Chuvaev V.F., Mailieva G.K., Каrpukhina T.A., Dokl. AN SSSR, 264 (1982) 900. 35. Chuvaev V.F., Zh. Neorg. Khimii. 47 (2002) 634. 36. Bondareva V.M., Аndrushkevich T.V., Maksimovskaja R.I. et al., Kinetika i kataliz. 38 (1997) 122. 38. Maksimovskaja R.I., Kinetika i kataliz. 36 (1985) 910. 39. Shingisbaev B.M., Avtorefer. dis. kand. Almaty, Kazakhstan, (1995) 26. 40. Brouer G., Rukovodstvo po neorganicheskomu sintezy (Mir, Мoscow 1986). 41. Highfield J.J., Moffat J.B., J.Catal. 83 (1984) 217.